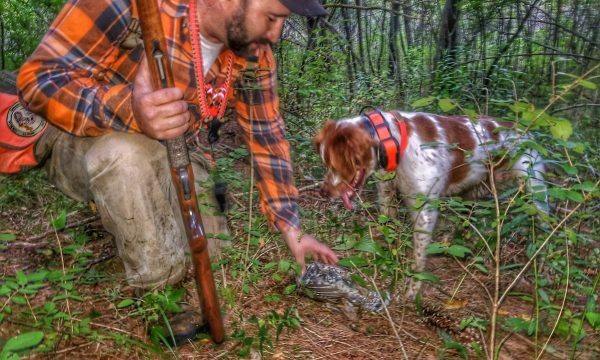 Grouse hunting dogs are an important part of your experience. Your partner on this journey will be Louis (loo-E). 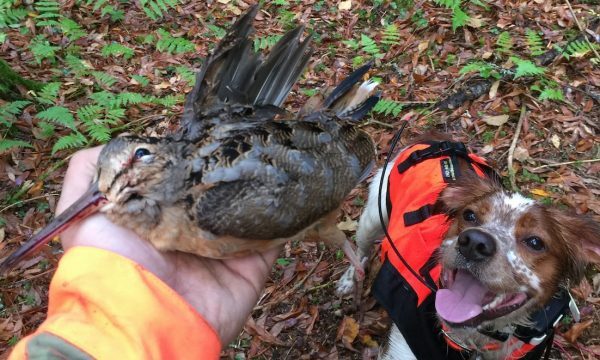 He’s a three year old grouse and woodcock hunting machine. After a tour in Afghanistan which forced me to re-home a dog, I began the search again. I had been dogless for several years and had been waiting for the right time to get another dog. 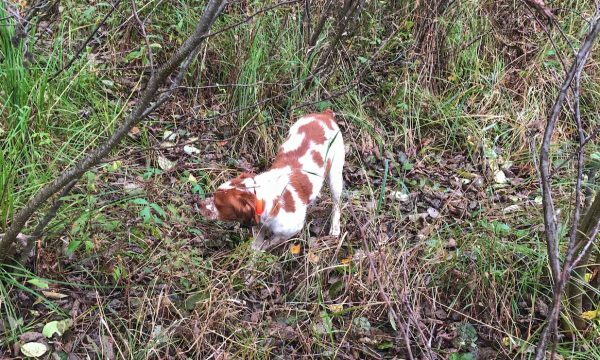 I’ll preface my following words by saying that going into the woods to hunt without a grouse hunting dog leaves you with a pretty empty feeling. 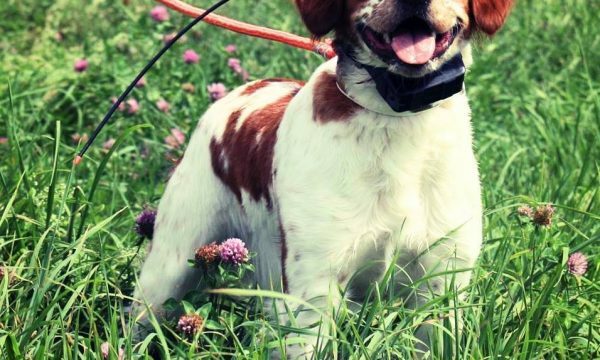 I was in a big hurry to get another hunting dog but I knew it was important to focus my search on the RIGHT hunting dog. Louis is from L’Escarbot Kennel in Minnesota. L’Escarbot is the birthplace of many great French Brittanys you’ll find in the grouse covers across the north country. I knew quickly I had something special with Louis, he was crazy about birds right away, soaking up every bit of training I gave him. Things were going well but I recognized some mistakes I was making with him. So I did something I can’t believe. I abandoned our training program other than basic obedience and just started overdosing him on wild birds. I cannot believe, no matter how much I’ve read, what a massive difference this made. 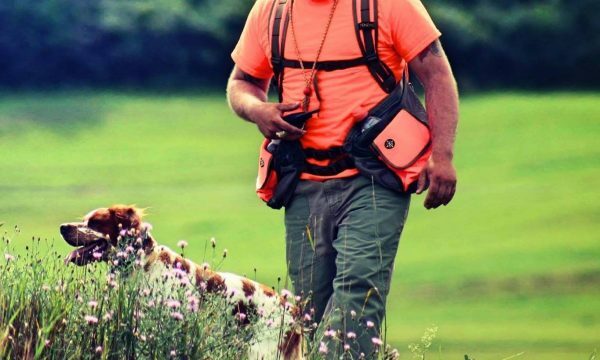 Louis may be “the one”, that special dog every bird hunter gets in their life. He’s not perfect, but he’s a bird finding machine, he hunts for me and I’ve never had a bad day with him. 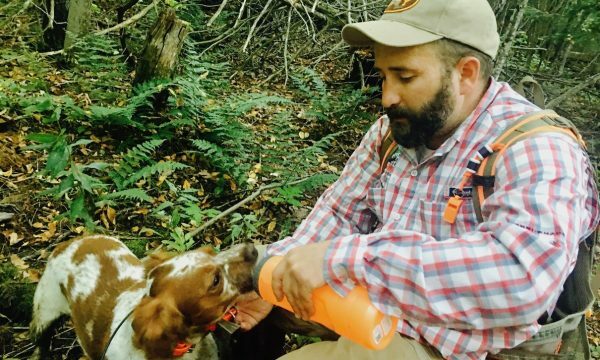 I’ve had the chance through guiding to hunt behind lots of dogs. Trial champions, grouse champions, show champions, invitational dogs and every other champion there is. All their owners tell you their dog doesn’t leave any behind, but I can tell you, they do. 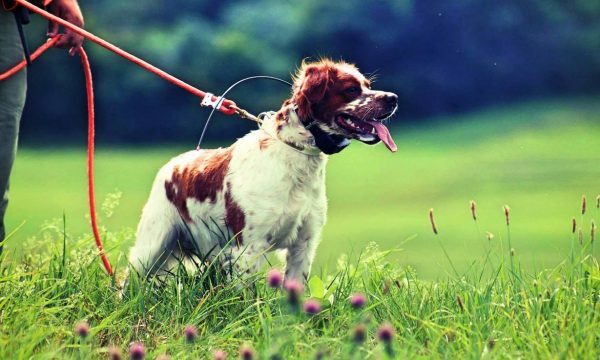 As owners we’re proud of our dogs and think they’re the best thing since sliced bread. I’m here to tell you mine, is damned close. I feel blessed to have him. In our first season he put up just shy of 400 birds before October was over. With exception of one season, where numbers were down across the states, he’s maintained these numbers. I say this as a proud owner but also with hopes of encouraging you to visit and spend time with this amazing animal. Voodoo was the first dog I ever bought. I bought Voodoo from Oklahoma after speaking with tons of breeders. You need to feel comfortable with your breeder, you have big decisions to make. I you take anything from this paragraph take that. I went with R.L. Dalrymple and have nothing but good things to say about him. Along with Voodoo my father purchased Vega, a black dog which to date was the best hunting dog I’ve ever seen. Voodoo was retired early after being involved in a car accident that took Vega’s life far too young. Fortunately he lived a long happy life right up to the day father time took him. Bertie came to me at an insane time in my life. My girlfriend was halfway through a pregnancy and I was just starting my solo guiding career. I’d been without a hunting dog for several years due to military assignments. I knew we were bringing a son into the world and it was time to get another dog. Dogs were a huge part of my upbringing, so I knew I wanted a dog around for my boy. I wasn’t looking for her but she found me. I was in the early stages searching for a breeder when I saw her picture online. She came from a family going through some hard times. They were looking for someone to love her, hunt her, and to provide her a good home. 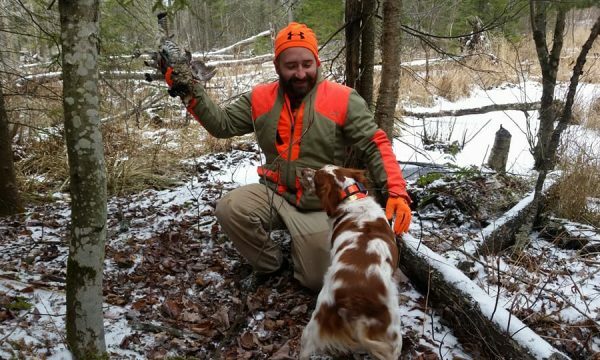 We took Bertie in and I killed my first Adirondack grouse over her.